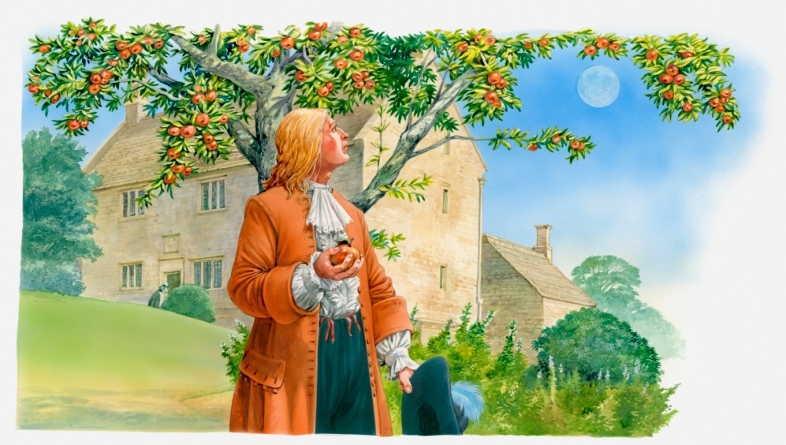 Did Isaac Newton really discover gravity when an apple fell on his head? | What can I learn today? Did Isaac Newton really discover gravity when an apple fell on his head? Every so often – usually when I’m recounting the alleged thievery of biscuits belonging to an understanding high school Physics teacher – my brain reluctantly turns its attention towards science. So today I decided to put the focus to good use and look at the truth behind a popular scientific legend – that Sir Isaac Newton discovered gravity when an apple fell on his head. And, like all the best myths from history, it seems to have at least a little grounding in reality. I found one intriguing backgrounder on the topic at the Culture Lab blog at New Scientist, which profiled a historical manuscript that went on to become a biography of the scientist by William Stukeley, who was apparently told the following anecdote firsthand by Newton. He remembers the telling as such..
You can read the full manuscript here at the Newton Project, which is a non-profit group dedicated to making his unpublished and published works freely available online. If you have time, I do recommend it, as it offers some pretty interesting insights into the development of his theory on gravity and more. ← What inspired Lisa Lutz to write the Spellman books?